Brian's Story: Always ready for outdoor fun. Always ready for outdoor fun. We went camping a few times as a family. Brian took to it like a fish to water. As a youngster he went to a camp in Catalina and fell in love with it. He returned to it as an adult, with different friends. 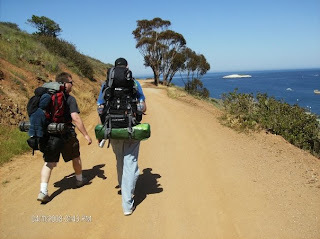 Here, I believe, there were three of more people hiking up to the campsite in Catalina. He was not averse to roughing it all the way to the opposite side of the island. Some of you who camped with him can add details to this post. I'm just proud of how resourceful and self sufficient he was. This last Easter holiday, he would have camped here, his dog with him, and as many friends as could make it. I have lots of pictures of Brian's camping. It would be great if those of you who camped with him would post some of your pictures. His birthday is coming up. Can you think of a better way to pay homage to his life? He was the baby in the family.